1. Son of Serug; father of Terah and, consequently, grandfather of Abraham. He is said to have lived one hundred and forty-eight years (Gen. xi. 22-25; I Chron. i. 26). 2. Son of Terah and brother of Abraham and Haran. He married the latter's daughter Milcah (Gen. xi. 26-27, 29). Joseph Halévy ("Recherches Bibliques," i. 328) derives the name of Nahor from the Assyrian "Niḥaru" (= "cachalot"); a king of this name occurs in the prism inscription of Esarhaddon (col. iv., line 21). Although it is not stated that Nahor emigrated with his father and brother from Ur of the Chaldees (comp. Gen. xi. 31), yet from the fact that Haran is called "the city of Nahor" (comp. Gen. xxiv. 10, xxvii. 43) it may be inferred that Nahor took part in the emigration and settled at Haran (comp. Halévy, l.c. p. 303; see also Haran). Nahor was the progenitor of twelve Aramean tribes through his twelve sons, of whom eight were born to him by his wife Milcah and four by his concubine Reumah (Gen. xxii. 20-24). 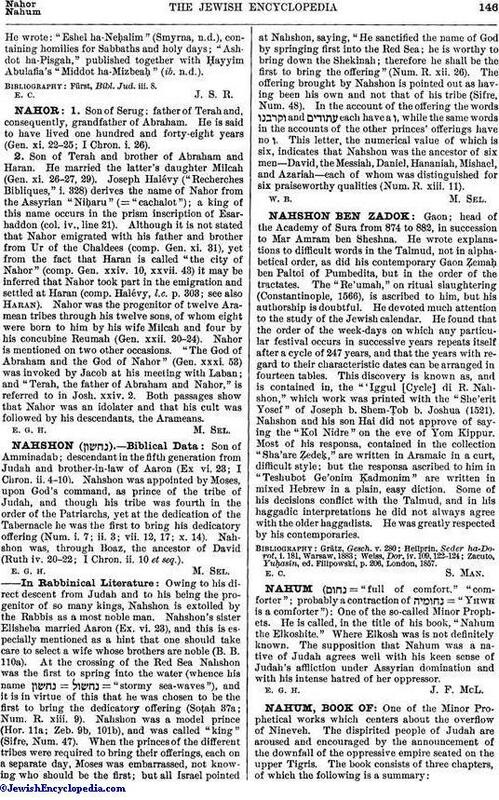 Nahor is mentioned on two other occasions. "The God of Abraham and the God of Nahor" (Gen. xxxi. 53) was invoked by Jacob at his meeting with Laban; and "Terah, the father of Abraham and Nahor," is referred to in Josh. xxiv. 2. Both passages show that Nahor was an idolater and that his cult was followed by his descendants, the Arameans.